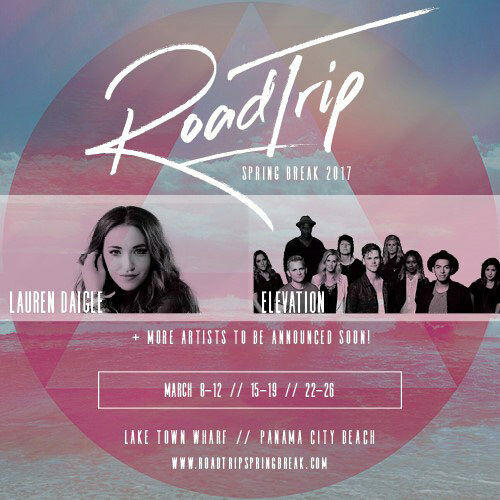 (High Point N.C.) December 1, 2016 - Premier Productions announces dates for RoadTrip Spring Break 2017, where Christians from across the country can gather in Panama City Beach, Fla. at Laketown Wharf to experience music from artists such as Elevation Worship, Lauren Daigle and Colony House for an all-new spring break experience. RoadTrip Spring Break 2017 offers a choice of three separate weekends including March 8-11, March 15-18, and March 22-25. Packages are on sale beginning Friday, December 2, 2016. "RoadTrip is a 4-day beach party for 18 to 25-year-olds, where Christians from coast-to-coast gather to redefine spring break," said Shane Quick, co-owner, Premier Productions. "RoadTrip is your opportunity to build new relationships, experience incredible shows, and have one unforgettable party with people who share the same heartbeat." More artists in the lineup for RoadTrip Spring Break 2017 announced soon. To purchase packages to RoadTrip Spring Break 2017, visit: www.roadtripspringbreak.com. About Premier Productions: Formed in 1996, Premier Productions is the largest producer of Christian concert events in the nation and the co-founder of the Winter Jam Tour Spectacular, Christian music's largest annual tour! Premier promotes award-winning artists with No. 1 hits such as - TobyMac, Skillet, Casting Crowns, Hillsong Live, Hillsong UNITED, Lecrae, Bill Gaither & Friends Homecoming, Jesus Culture, Kari Jobe, Matthew West and many more! For more information on Premier Productions, please visit premierproductions.com. For more info on Lauren Daigle visit the JFH Artists Database.